What are the Best Food Trucks in North Miami Beach? 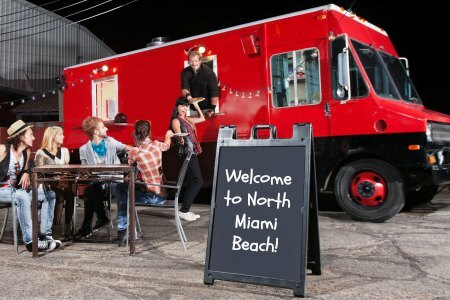 Home » Local Events » Where are the Best Food Trucks in North Miami Beach? Where are the Best Food Trucks in North Miami Beach? Ask any South Floridian where he or she prefers to get their meals, and a plurality of your responses will almost certainly mention a food truck of some sort. This trend, long popular in college towns and mountain enclaves, has found its way to North Miami Beach, and we’ve got some great options to show for it. But which are the best food trucks around? Here’s our short list. These purveyors of assorted tacos, burritos and salad bowls pack an undeniable punch. The menu is littered with such outstanding ingredients such as Dr. Pepper shredded skirt steak, tropical pineapple slaw, sesame soy seared Ahi tuna, and spicy Korean pulled pork. They do everything well. If it’s freshly-made, locally-sourced food that you’re after, look no further. They get high marks not just for their accessibility — honestly, who doesn’t love a well-made burger? — but there’s much more to Virgo Bomb than just the basics. Try the Lemon Pepper Parmesan Fries, and then tell us that we’re wrong. There’s something about well-made barbecue that makes us salivate as we write this. But for Pirate Brothers, the ribs, pork and brisket are just the beginning. They also offer one-of-a-kind items like rib tacos and stacked hot dogs, making for a culinary delight that you’d be surprised to find outside of Texas or Memphis. This might be the most popular Mexican-fusion food truck in the Miami area, and it’s not surprising once you’ve tried their food. Their menu is vast, with vegan and gluten-free options that might not be available elsewhere. And, of course, their burritos and tacos are already the stuff of legend in these parts. There are obviously many other options that we may have missed, so what are your favorites? Include them in the options below, and come see us soon at Prestige Imports! This entry was posted on Wednesday, April 5th, 2017 at 4:39 pm	and is filed under Local Events. You can follow any responses to this entry through the RSS 2.0 feed. You can leave a response, or trackback from your own site.